On this segment of Master Minds Monday hosts Damon Rawls and Phylecia Tarael-ANU discuss the awesome energy of Orisha Oya. Oya is one of the 7 major Orisha in the Yoruba tradition and is highly effective when called upon to support the growth and success of a business. Orisha are forms of consciousness which can be found throughout nature. Oya represents the energy of storms, wind, lightning, tornadoes and hurricanes. She is also known as the owner of the marketplace and the cemetery. When learning of this great Orisha one will almost always come across information about her mate Sango. Oya's energy is a guiding force for Sango and can be found in the micro-burst that precedes lightning and charts its path, dictating where it will strike. Oya is also known as the energy of transformation. The one who helps the ancestors transition from this realm to the next. This is why it is said that she lives at the gates of the cemetery. The woman of the marketplace is also known for her abilities in the supplanting of power. Just as the tornado can pick up a house and deposit it miles away Oya can take power away from one and give it to another. A clear example of this is the stock market. This Orisha is also an excellent cleansing force which can be used to remove negative energy from a situation or space. Host Phylecia shares that her first ritual was dedicated to Oya. The relationship she was in fell apart and she needed to regain power. A bath infused with Oya's herbs mint and myrrh helped her immensely. A great ritual for getting a job or growing a business is to speak every detail of the job you wish to receive or the ways you would like to see your business grow. Be very specific and go so far as to include the exact salary or monetary growth you expect. Then make an offering which includes some of Oya's favorite items including eggplant, red wine, red grapes, plums etc. You may do rituals to Oya at a cemetery or during the height of her moon cycle which is the full moon. 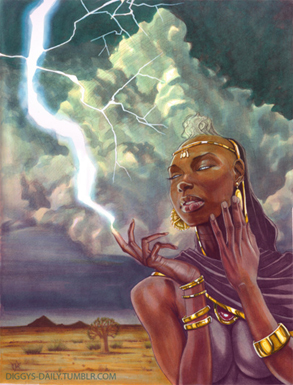 Oya is a powerful, dynamic and complex energy that can be of great help to those who are courageous enough to call on her. I want to learn everything about Oya!! !